News Alloy is a two and a half year old web based RSS feed reader that rivals market leaders Bloglines and Google Reader in features – and it has a mobile web version (pda.newsalloy.com). News Alloy on the PC is very similar to Google Reader. It’s a two column design with the feed list on the left and posts on the right. The default is to show all items from all feeds with most recent ones first, the “River of News” style. But you can also pick and choose from feeds to see posts from a single feed. Like Google, News Alloy is very Web 2.0’ish and Ajaxy with lots of hotkeys and widgets that refresh asynchronously without reloading the page. NewsAlloy on the desktop is just as powerful and usable as Google Reader. Both are attractive visually but it this were a beauty contest, Google Reader would be the winner. The similarity between News Alloy and Google Reader carries over to the mobile editions. Both display all unread items from all subscribed feeds in a single list on the front page, clicking an item opens it in a new page. Google lets you add a star to favorite posts, News Alloy’s equivalent is a pin. Google puts starred posts in their own folder which shows up in both the PC and mobile versions. With News Alloy, you can pin posts on the mobile but you can only view the pinned folder on the PC. While News Alloy and Google Reader seem very similar there is a big difference in their mobile editions and that’s the size of the mobile pages and thus the types of devices they target. Google Reader produces much smaller page sizes and works on the limited browsers built in to most phones. Images are resized and long posts are split into multiple pages. Links to external sites go through the Google mobile transcoder. Feed Alloy makes no effort to reduce page sizes. Each post is rendered as a single page with full images, links go straight to their target – usually a non-mobile site. This is not necessary a bad thing. For users of Opera Mini like me, it’s actually good. Mini can handle huge pages and images and is much faster rendering a single big page than multiple small ones. The same is true for smartphone browsers especially on 3G networks . The king of the big page mobile readers is Bloglines which displays all of a feed’s posts as a single page which can be huge – 100KB or more for a feed with many unread posts. Opera Mini loads a page that big with no complaints. I read a lot of feeds and am fussy about feed reading tools. Because I read the same feeds on multiple desktops and phones I need a web based reader to keep what I have and haven’t read is always in sync regardless of which device I’m using. Of course, any reader I use has to have a mobile version. I’ve tried quite a few readers but there are only two that I liked enough to use for any length of time, Bloglines and Google Reader. I switched from Google Reader to Bloglines which creates even larger pages than News Alloy for one reason – I could read feeds twice as fast as a few big pages in Bloglines compared to dozens of small ones with Google Reader. But Bloglines has quite a few bugs, including two in the mobile edition that really annoy me. Bloglines Mobile’s style sheet turns the color of all links to black, the same as plain text. Opera Mini doesn’t underline links so they are indistinguishable from text except when they have focus. I waste a lot of time cursoring through text looking for links! Bloglines marks all items in a feed as read as soon as you click on the feed name to load them. Which means that if network coverage drops while the items are loading they get marked as read without ever being displayed. 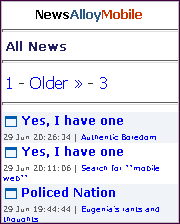 Read items more or less disappear from Bloglines. There’s a way to get read items back but it requires several steps and you have to know what feed the missing item was in. News Alloy doesn’t have either of the Bloglines bugs, it seems quite bug free actually, but because the pages aren’t as big, it’s not as fast in Opera Mini either. For this review, I switched to reading everything in Feed Alloy. I’ll give it a few more days but I think I’ll probably go back to Bloglines if – only for it’s speed. According to News Alloy’s blog, the site is running out of money which has been causing some downtime when their database server, which they can’t afford to upgrade, fills up. News Alloy’s for sale and a recent post suggests that they may have found a buyer. I hope that News Alloy survives as it shows a lot of promise – as an underfunded startup they’ve developed something that compares very favorably with Google’s best. This entry was posted in RSS Readers, Site Reviews by Dennis Bournique. Bookmark the permalink.